What do we learn from the “Niger Delta Blues” song? 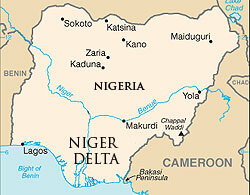 “Niger Delta Blues” is a song from a group called BANTU (Crew). The group started as four people in Germany and now consist of 13 people, 11 men and two women. You can read more about the crew here. This part of the song shows how the people from Niger Delta has it, after the oil industry in their area have ruined the enviormment. They live in inhumane conditions. Most villiages has no no clean drinking water, no electricity, no schools, no medical clinics, no social clinics and many diseases. They feel like they don’t belong in the country anymore. They feel like they are not a part of Nigeria. They’re not being heard, no matter how hard they try. People are dying and, yet they’re still not heard. In the second verse, the quote above, we get to know that this problem is not just for the Niger Delta era, but also the whole Nigeria. What used to be just relevant for the era, is also relevant for the whole country. The lyrics to the song. The task ,I did number 1 opition 2. Next Next post: Gran Torino- After watching the film. Camilla's Blog Blog at WordPress.com.